Rep. Tim Ryan said Sunday that his 2020 presidential campaign is about "rebuilding the middle class" in the United States. "We’ve got to stop talking about the minimums, we got to figure out how we create an economy in health care, in energy, within manufacturing, where people can make $30, $40, $50 bucks an hour, that's the American dream," the Ohio Democrat told ABC News Chief Anchor George Stephanopoulos on "This Week." Ryan, who has represented the state’s 13th Congressional District since 2003, announced his candidacy earlier this month during an appearance on "The View." "Right now most polls show that a majority of the country believe the economy is doing well and giving President Trump some credit. So this the best ground to challenge him on?" Stephanopoulos asked. "Well, it's not doing well where I come from, and it’s not doing well in a lot of places around the country," Ryan responded. "You know, we talk about increasing the minimum wage, George. People used to make $30, $40 bucks an hour. Yeah, the unemployment rate’s low; people are working, you know, one, two, three jobs to try to make ends meet." 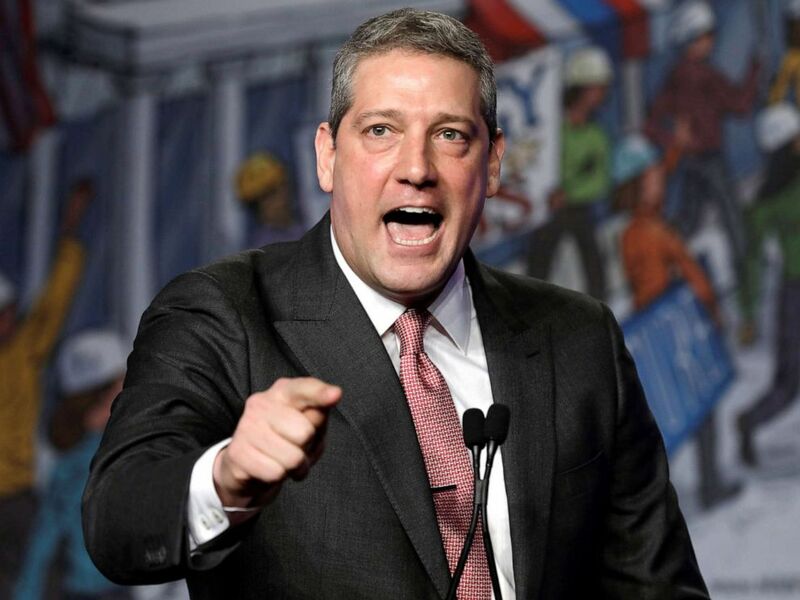 Democratic presidential candidate Rep. Tim Ryan speaks at the North America's Building Trades Unions (NABTU) 2019 legislative conference in Washington, April 10, 2019. On Sunday, Ryan said "we need a public option for people to be able to get health care in the United States." Sen. Bernie Sanders, I-Vt., said last week that his plan for Medicare for All would "get rid of insurance companies and drug companies making billions of dollars in profit every single year." Ryan also resisted the notion that the Democratic message is being warped by Republicans attempting to label plans like Medicare for All as "socialist." Stephanopoulos asked Ryan whether he thinks these policies make Democrats "vulnerable." “Not at all,” Ryan said. "We want a health care system that actually keeps people healthy and that's the transformational approach I'm going to take." Ryan has previously called the "Green New Deal" proposal a "values statement," but also said that he wanted greener energy and automotive sectors to drive the economy in the future. "Take electric vehicles for example," he said. "We’ve made one to 2 million electric vehicles today. There’s going to be 30 million made by 2030. Who's going to make them? I want those made in the United States, George. I want the batteries made in the United States, I want the charging stations made in the United States." Ryan is unabashedly pro-business in a field of candidates that has largely rejected support from big corporations. Several weeks ago, Ryan told a New Hampshire radio station that Democrats "come off sometimes as hostile to business." "We need to sit down with the business community,” he said Sunday. “We need to sit down with the educational community and use the tax code and figure out how we rebuild the industrial base in the United States."